BRISTOL, R.I. — There’s a lot of history, much of it violent, at the 375-acre property now occupied by the Pokanoket Tribe. In 1675, the mostly wooded site on the edge of Mount Hope Bay saw the first battle of King Philip's War. A year later, Metacom (King Philip) was killed and butchered by colonists here. A massive rock protrusion known as "King Philip’s Seat" marks the site where Metacom presided over tribal meetings. More recently, the land was home to an amusement park and summer resort. It hosted a missile base during the Cold War. The heirs of industrialist Rudolf F. Haffenreffer Jr. gifted the land to Brown University in 1955. Today, Brown University keeps a research center and a warehouse for Native American artifacts and other historical pieces for its Haffenreffer museum in Providence. The Pokanokets are contesting the “Turf and Twig” ceremony that purportedly transferred the land to colonists in 1680. Legal and administrative challenges have failed to reclaim their ancestral territory from Brown University. In 2015, Pokanoket Nation sought to gain state and federal legitimacy as indigenous people. Those efforts stalled, and the tribe is preparing lawsuits against the town of Bristol and the state to reclaim the land. 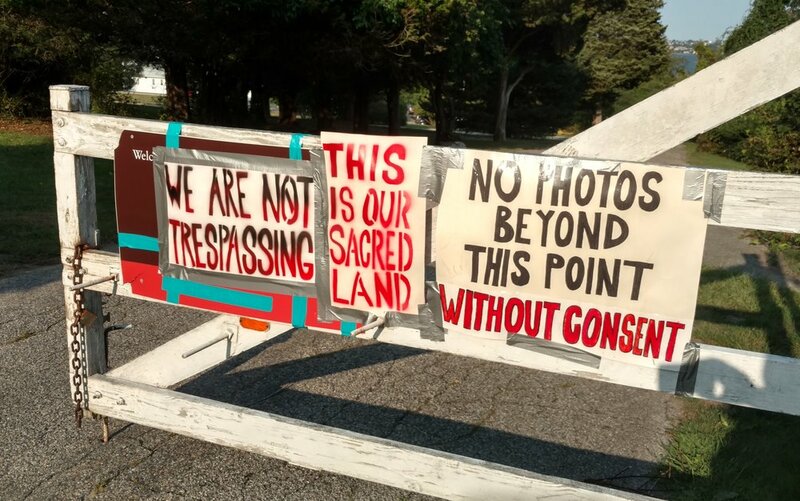 On Aug. 20, the Pokanokets and activist groups took over the entrance and compound to Brown University's Haffenreffer property and set up an encampment outside the main warehouse. 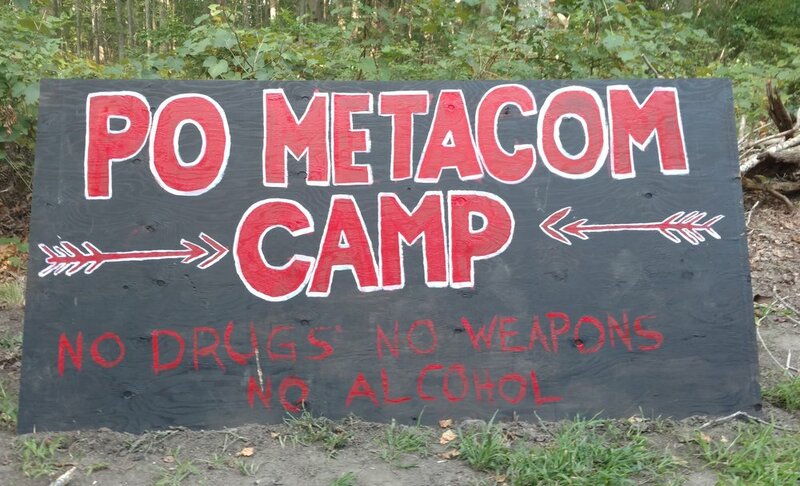 About two dozen tents and trailers were set up as "Po Metacom Camp" to house tribal members and activists. “We as aboriginal citizens have been denied our birthright to our family’s land, our sovereignty rights, therefore states and powerful organizations have held our wealth over and over to the point that they believe it is their natural gift and natural right to have our property,” said Sagamore William (Po Wauipi Neimpaug) Guy, leader of the Pokanoket Tribe. In its initial statement, Brown University gave its support for the Pokanokets' right to assemble on the land. “Given the tremendous historical and cultural importance of the Mount Hope area, the Haffenreffer Museum staff and Brown University have long valued their relationships with local Native American communities,” according to a Brown University press release. On Aug. 22, representatives from Brown and the museum met the tribal leaders at the entrance to the encampment. “This was the beginning of a conversation that we expect to continue as we work toward a resolution. We are open to engaging in sustained conversations about ensuring the best long-term solution for access for all the Indigenous Nations in this area,” the university said in a statement released after last week's meeting. That goodwill dissipated somewhat, when faculty from Brown’s Native American and Indigenous Studies (NAIS) program sent an e-mail to students and faculty that questioned the legitimacy of the Pokanoket Tribe. According to the Aug. 24 message, members of the Pokanoket Nation claim ancestry to King Philip but they are affiliated with another tribe. NAIS explained that the Pokanoket joined the Mashpee Tribe after King Philip's War. While Brown University permits the Pokanoket to conduct tribal ceremonies at King Philip’s Seat, the tribe doesn't have federal or state recognition, such as the Narragansett Indian Tribe of South County, nor are the Pokanokets recognized by other Wampanoag tribes. Without any federal or state recognition, the Pokanoket Tribe isn't able to hold ancestral land in trust, according to the NAIS. “There is a delicate yet important technical difference between holding Native ancestry and holding nation status, and that is at the heart of the issue here,” according to the e-mail. NAIS also questioned the participation of The FANG Collective, a Pawtucket-based environmental and social-justice group that helped organize the occupation. NAIS noted that FANG was established to oppose fossil-fuel expansion and didn't communicate with other local, recognized tribes prior to the action. NAIS discouraged the Brown community from sharing FANG’s requests for funds, camping gear and participation in an online petition in support of the occupation. FANG and Pokanoket leaders promptly responded with an e-mail and post on social media. They called the NAIS claims inaccurate and misleading. “We are shocked and deeply disappointed that Brown University would openly attack our organization and attempt to discredit our work and sacrifice. We are even more disappointed that Brown University would publicly attack the Pokanoket Nation and challenge their legitimacy. This reckless behavior that upholds the legacy of white supremacy and colonization is unacceptable and must not be tolerated," FANG wrote. FANG also noted that it has worked with other tribal nations such as the Rhode Island Indian Council, the Narragansett Tribe and Mashpee Wampanoag to support opposition to natural-gas pipeline projects. Po Wauipi Neimpaug called the NAIS statement “nonsense.” The Pokanoket name was outlawed during King Philip’s War and the tribe then took the Wampanoag name. The Mashpee weren't a recognized tribe until 1834 and the Pokanoket has few bloodlines to the Mashpee, according to Neimpaug. “They’ve (Mashpee) stolen our history to get federal recognition,” he said. The Pokanoket, he said, owned the land prior to any agreements for tribal recognition and as such have an aboriginal title to the land, as defined by the 2008 United Nations Declaration on the Rights of Indigenous People. Despite the rancor, the tribe and Brown University intend to continue negotiations this week.